The Generac SpeedWash™ is a complete pressure washing system that provides ALL the tools you need for every application. It delivers the raw cleaning power you need to accomplish the toughest cleaning tasks. A high quality Generac OHV engine and a professional grade axial cam, brasshead pump deliver up to 3200 PSI and 2.7 GPM. Then we complement the core unit with innovative, user-friendly features that make using it fast and easy. Generac's OHV engine and an aluminum axial cam pump deliver up to 2900 PSI and 2.4 GPM. Then we complement the core unit with innovative, user-friendly features that make using it fast and easy. Introducing the Generac SpeedWash Pressure Washer! It's ultra-fast, easy to use, and built to last! Clean off the winter grim from your patio furniture with the all new Generac SpeedWash Pressure Washer. Here's how! Don't let a chore like cleaning your driveway take up your whole weekend. Learn how to fast and efficiently clean your driveway with the new Generac SpeedWash Pressure Washer. Dirty Deck? Clean it up with the all new Generac SpeedWash Pressure Washer. Maximize your cleaning results with this great video showcasing how to pressure wash your vehicle with the NEW Generac SpeedWash Power Washer! 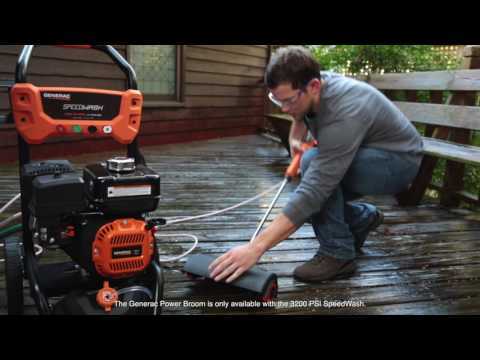 Watch this easy to follow, step-by-step setup video to setup your Generac SpeedWash Pressure Washer. Proper maintenance is critical to keep your Generac SpeedWash Pressure Washer in tip-top shape. Watch this how to video to learn more.